I know I've seen this reported before, but that's quite long ago (probably months) and may have been in a comment or something else without the "Kinja help" tag, so it probably went unnoticed. 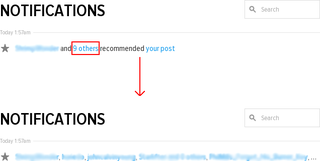 Anyway, if I get lots of recommends on an article or comment, and go to "all notifications" and click the button to see who recommended it, it just prints out the screen names of people who fit on one line of text, and there's no way of seeing what other people recommended the post. Also, the link to the post disappears. It would be great if this behaviour was replaced with one which displays the full notification - spread over several lines if necessary - rather than just the first line. This is not really a big issue for me, but still something I'd like to see fixed. Also, I'm curious how on earth implementing the current behaviour can be less work than just printing the whole notification.